The classic series is our top line heavy duty stainless steel full surface utility hinge. The simple clean lines of the fluted border add an element of detail to the hinge, and visual character to both vintage and modern gates and doors. Includes screws. 3" x 2-1/2" hinges have a 1/4" pin and 2.5mm leaf thickness. 3-3/4" x 3" hinges have a 5/16" pin and 2.8mm leaf thickness. 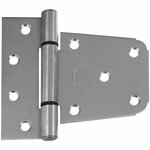 4-1/2" x 3-5/8" hinges have a 3/8" pin and 3.0mm leaf thickness. 6" x 4-1/2" & 7-1/2" x 5-5/8" hinges have a 3/8" pin and an extra heavy 3.5mm leaf thickness. The classic series 1100 is our top line heavy duty stainless steel full surface utility hinge. The non-fluted style is available in a mill or polished finish. Includes screws. This satin stainless steel stub t-hinge has been designed for applications with narrow mounting surfaces, such as gates, barn and shed doors, storage bins, and tool boxes. It has an exclusive bearing design that eliminates metal to metal contact, where the bearings provide for a smooth, quiet operation and remain dimensionally and structurally sound in hot and cold climates. It has offset screw holes (sized for #10 flat head screws) for extra strength and to prevent the wood from splitting. 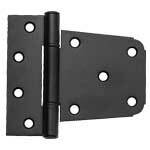 This hinge has a matte black powder-coat finish on stainless steel material. It has been designed for applications with narrow mounting surfaces, such as gates, barn and shed doors, storage bins, and tool boxes. It has an exclusive bearing design that eliminates metal to metal contact, where the bearings provide for a smooth, quiet operation and remain dimensionally and structurally sound in hot and cold climates. Leaves are 16 gauge electro polished type- 302/304 stainless steel. Staked stainless steel pin is 1/8" diameter. Each hinge includes #8 x 5/8" type 18-8 stainless steel Phillips flat head tapping screws.